Every time tyres are used on the road, TRWPs are produced by the friction between tyres and the road surface. TRWP are a mixture of tyre tread material and elements from the road surface. These tiny particles are readily inhaled, and thus have impact to human health. According to the study: “Samples indicated that TRWP concentrations in the PM2.5 fraction were low, representing an average contribution to total PM2.5 of less than 0.3%. However, the study found significant differences in TRWP contribution to PM2.5 between the three cities, and no significant correlation between TRWP in PM2.5 and traffic count”. For now, the findings are not conclusive. The authors emphasised that further research is needed, starting with additional sampling for TRWP in ambient air that would help establish the extent of how tyre wear contribute to non-exhaust PM emissions to ambient air. As the study indicates that properly checked and inflated tyres not only prevent road mishaps but also air pollution. notion about end of life tyres (ELTs), says Angelica Buan in this report. orn-out tyres spell danger for millions of commuters and motorists who are at risk of road accidents. 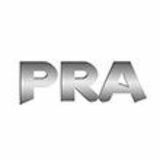 The World Health Organisation (WHO) estimates that nearly 1.4 million people figure in road traffic crash related fatalities each year. Vehicles with worn-out tyres are thrice as likely to end up in a crash, according to US’s National Highway Traffic Safety Administration (NHTSA). On a macro scale, worn out tyres not only pose traffic hazard, with a study revealing that worn out tyres also contribute to air pollution. 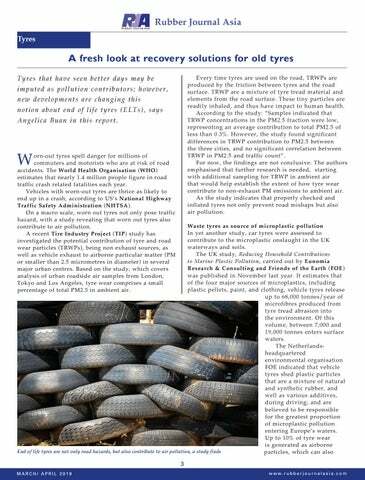 A recent Tire Industry Project (TIP) study has investigated the potential contribution of tyre and road wear particles (TRWPs), being non exhaust sources, as well as vehicle exhaust to airborne particular matter (PM or smaller than 2.5 micrometres in diameter) in several major urban centres. Based on the study, which covers analysis of urban roadside air samples from London, Tokyo and Los Angeles, tyre wear comprises a small percentage of total PM2.5 in ambient air.